Ready for a calm and peaceful holiday? I’m sitting here listening to Christmas music, looking out the window at snow (I’m up at our local ski hill in the lodge while my family is out tubing) feeling like I might be finally getting into the “season”! I’ve been contemplating this past year and just realized that even though life and work has been really full these past few weeks, I’ve been managing my day to day and week to week better than in the past few years – even looking forward to Christmas more than I can recall. And what I realized is that this is likely due to a combination of practicing gratitude with more intention this year AND aiming for more simplicity than in the past. 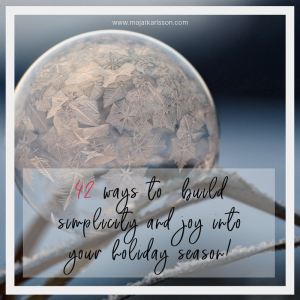 In case you’re wanting some inspiration yourself, I’ve come up with a list of 42 things you might find worthwhile to simplify and bring on more joy as you proceed through this holiday season (in no particular order). Pick and choose, ignore completely, or use these to find your own inspiration! 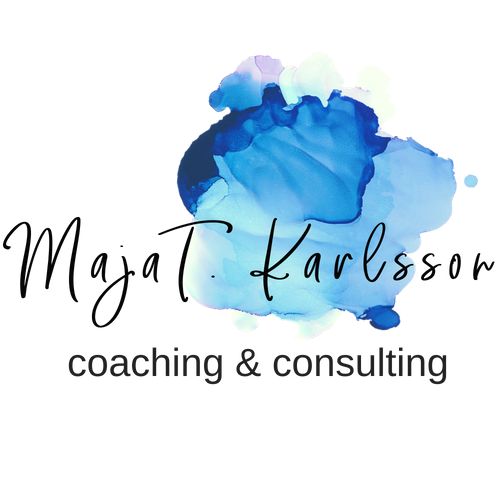 I hope this helps to build more join into your life! 42 Ways to Build Joy! 1) Stop Christmas shopping today – no matter how much or little you’ve done. 2) Make some “gift certificates” to give out to loved ones meant to share time and experiences together rather than more “stuff”. 3) Look at your calendar and cancel one “thing” – that you agreed to because of obligation. 4) Ignore the chaos around you for just one day. 5) Decide that you’ve done enough on a particular project and STOP. 6) Finish a job that has been hanging around for a while (e.g. decorating the Christmas tree or cleaning out your spare room). 7) Plan that your holiday dinner will be a Potluck and let everyone know what they need to bring. 8) Turn on some music and dance! 9) Make a cup of your favourite tea or coffee and curl up on the couch with a good book. 10) Go for a walk. 11) Move 2 things from today’s to-do list to next week (or the week after)! 12) Delete something permanently from your to-do list. 13) Rename your “to-do” list to a “get to do” list. 14) Say 3 things you’re grateful for out loud. 15) Send an “I love you” text to someone. 16) Cancel all commitments as a family and have movie or board game night instead. 17) Make a “to-love” list and write down all the things you love to do and when you think you might fit them in. 18) Set a timer for 20 minutes and clean out a part of your closet. 19) Set a timer for 20 minutes and clean out a pantry shelf. 20) Donate some money to your favourite charity. 21) Check out and follow the steps in this other post to clean out some stuff. 22) Call a relative or friend you haven’t talked to in a while. 23) Treat yourself like you’d treat a cherished friend. 24) Tell that noisy voice in your head to “get lost” or “be quiet”! 25) Give yourself permission to go to bed without a completely clean _________ (e.g. kitchen…you fill in the blank). 26) Meet your friends at a restaurant or coffee shop instead of having everyone over to your house (so you don’t have to “clean”). 27) Set a 15-minute timer for a “tidy-time” where everyone in your house will tidy together until the timer goes off. 28) Consider what tasks you have that you can give to someone else (e.g. can you hire a housekeeper, is there a meal service you can engage sometimes). 29) Order that gift online and have it sent directly to the person (avoiding the post office). 30) Donate to a charity rather than giving gifts. 31) Eat breakfast for dinner – YUM! 32) Go to bed early – you can always read for a bit once you get there. 33) Turn off your work phone as soon as you walk in the door at home. 34) Wake up 30 min early and start a “mindful morning practice”. 35) Set a timer for 15 minutes and do a “mass email delete” – where you delete all those emails that you’ve just avoid. 36) Do an email list “unsubscribe” for all those regular emails that you never read and that are just cluttering up your inbox. 37) Find out which streets have lots of Christmas lights in your town or city and go for a drive or walk to admire them. 38) Have a bath with extra bubbles while enjoying a glass of wine or bubbly water. 39) Watch a cheesy holiday movie. 40) Find a YouTube video of something creative you’ve always wanted to do (e.g. knit a scarf, paint a picture, make a necklace) and give it a try. 41) Bake something easy and delicious with your family. 42) Bring extra baking to the office to share with others. I wish you and yours the very best of the holiday season, and I would love to hear what tips you have. Please comment below and share with others!